A quick two army, two player demo of Bin'Fa being played. 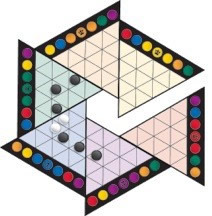 The playing area is in two parts: the triangulated area is the battle sector over which army units are deployed; the colored circles form the supply sector around which the supply marker moves in an attempt to obtain supply units. 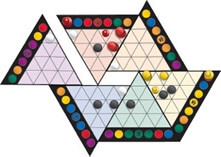 An army uses supplies when it moves, and each player, on taking possession of the dice, must decide whether to use the turn to attempt to obtain supplies or to use up supplies by moving an army. The object of the game is to surround opposing army units, thereby removing them from play. 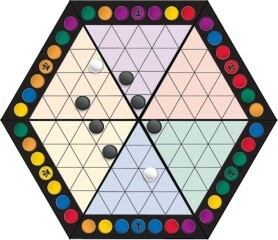 The winner is the player who has army units remaining on the board after all opposing army units have been removed. 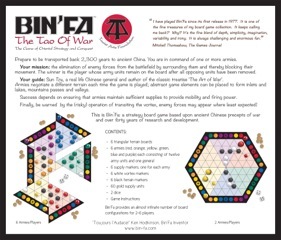 Bin-Fa armies move over a topography and terrain that is different for each game. The board sections can be arranged to form inlets or lakes; the terrain markers can form impassable mountain barriers or valleys; the vortex markers enable army units to cross the board in a single bound. The rules governing the movement of army units make cavalry charges possible whereby a player sends army units dashing across the board to attack an enemy position and, hopefully, return. 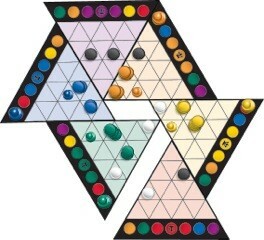 Although they have no official standing in the rules, alliances play a significant part in multi-player games. They can be open or secret. Knowing when and with whom to form alliances, as well as knowing when to break them, often determines who wins and who loses. Before each section of the rules is a quotation from Sun Tzu, author of “The Art of War,” the classic treatise on military strategy written twenty-three hundred years ago. These precepts apply as equally to the game of Bin-Fa as they do to actual warfare.